In a few years, Uber and Lyft have dominated ridesharing. It’s a classic story that embodies and demonstrates the wonders of the free market: creating profit for innovative producers while also making services cheaper for savvy consumers. But there are still some who believe that the ridesharing industry means fewer jobs and higher prices. As New York policymakers consider permitting ridesharing companies like Uber and Lyft to expand into upstate New York, the taxi monopoly is pushing back, claiming that companies like Uber and Lyft “pose a competitive threat.” It’s certainly true that these companies are serious competitors for taxi companies, but that isn’t a bad thing. For decades, taxi companies had a stranglehold on the urban transportation industry. Part of the reason for the taxi monopoly’s long-held dominance in big cities is rooted in special treatment from local government, creating a barrier to entry. In some cities, taxi companies are required to purchase medallions (licenses) to run cabs on the street. This structure has led to limited competition as taxi companies would accumulate as many of this set number of medallions as possible, driving the price as high as $1 million each, as was the case for New York City in 2013. Another factor was the renting of the medallions, which was also done at a sky-high rate of $40,000 a year, cutting into the profits of the drivers and increasing fares. Courts are starting to reject taxi companies’ claims to protection against market competition. Ridesharing companies like Uber and Lyft provide consumers with another, more efficient option. 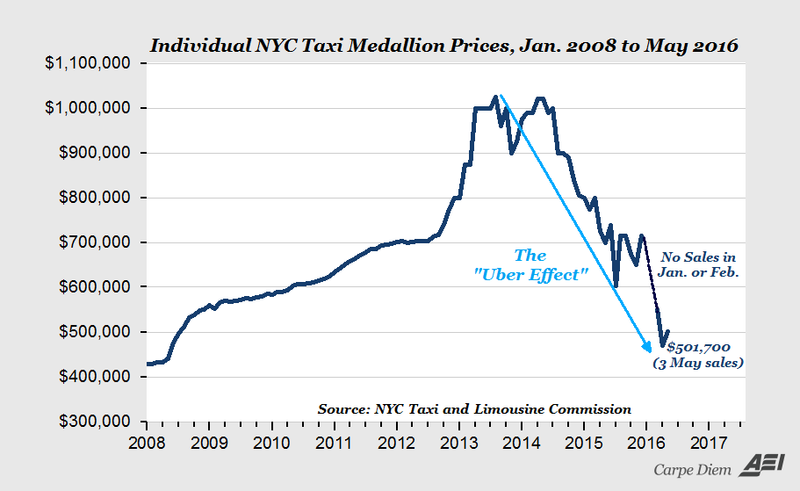 The evidence is in the choice of many to use Uber and Lyft, as well as in the prices and sales activity of NYC medallions. American Enterprise Institute shows that the price has dropped by 50% since 2014. As the taxi monopoly continues to crumble under market forces, companies are losing their once-steady supply of customers to rip off. Instead of pushing for regulatory reform to allow the taxi companies to compete without the burden of medallions, they want to shut Uber and Lyft out of the market, so they can keep the prices high. Brishen Rogers of the Temple University Beasley School of Law argues that Uber’s success isn’t simply due to it working around regulations (as critics often claim), but rather “lies in having reduced the transaction costs that otherwise plague the sector and provided the justification for its extensive regulation in the first place.” Essentially, ridesharing companies engage in creative destruction by eliminating wasteful and inefficient business models (taxi monopolies) and replacing them with more convenient and reliable alternatives. This process leaves consumers with better service at a lower cost. Uber and Lyft innovated and provided practical solutions to otherwise risky and expensive problems. It reduces the cost of transportation, which is good for the people of New York. Policymakers in New York and elsewhere should recognize the benefits that ridesharing companies offer to society at large. How do i fix connections to bluetooth audio devices and wireless displays in windows 10 http://fixwindows10connections.com many users have no any idea how to turn on bluetooth and any device in window 10 PC.